EDUCATIONAL LEADERS – Not sure how to present team meetings? Feel like everyone is tuning out? Need tools to guide you step by step? 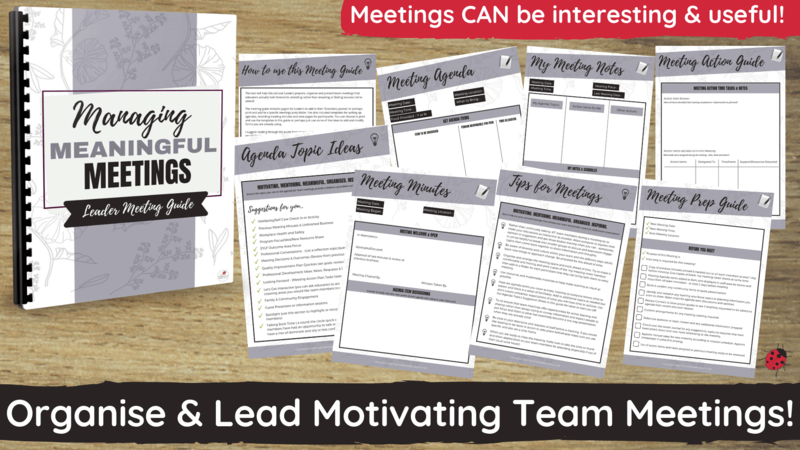 Use this meetings guide and the templates to show you step by step how to prepare, organise and present team meetings that educators actually look forward to attending rather than dreading or finding excuses not to attend! 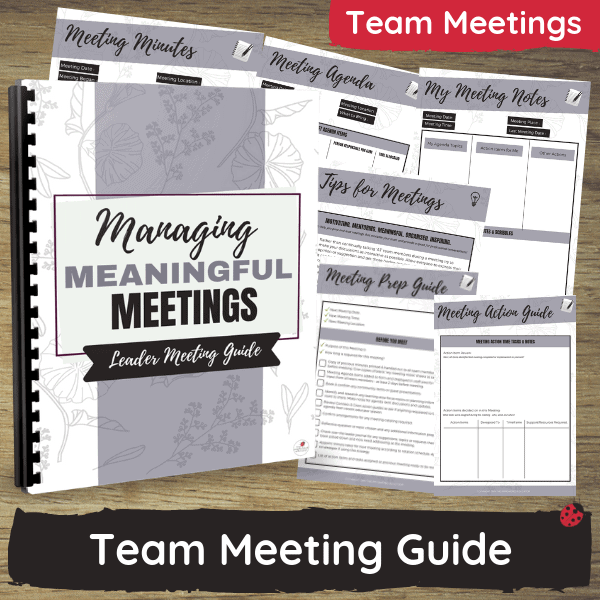 HOW CAN I USE THIS GUIDE TO ORGANISE & PRESENT TEAM MEETINGS? This tool will show Educational Leaders step by step how to prepare, organise and present team meetings that educators actually look forward to attending rather than dreading or finding excuses not to attend! Set up clear processes and expectations for meetings for all staff. Reflect on current practice in a supportive environment. Follow an agenda within set timeframes to lessen feelings of frustration and resentment by other participants. Help with suggestions and ideas for agenda items and how to ensure team members are able to have input into the meeting topics. Feel organised and well prepared for different learning styles and opinions raised in group meetings. Mentor and inspire educators rather than just directing or monitoring. Lead and support teams with confidence. Write meaningful meeting minutes that can be used to show evidence as well as record important decisions and action steps. Record progress on team action plans and collaborate to assign new tasks and goals. Present a balance of problem-solving issues and opportunities for learning and creative discussion. How to present information visually and encourage interaction and engagement in different ways. Provide opportunities for active learning and sharing. Consistently plan, review and identify new areas for quality improvement as a team. Simplify frameworks, outcomes and principles. Share programming ideas and inspiration. Introduce and explore professional development opportunities/past events with the team. 🌈 Links to the Educational Leader Journal for even more guidance and a record of meetings outcomes and planning evidence! See more of the journal HERE. 17 pages in PDF format with editable text boxes so you can either choose to print and add to a folder to take on the go with you or keep on the computer and type, printing only when necessary instead. 1. Tips for running effective and interesting meetings. 6. My Meeting Notes (for attendees). 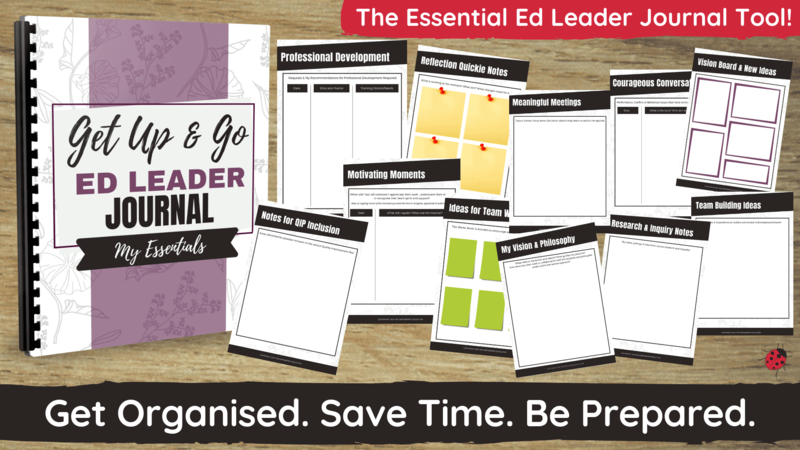 Ed Leader On the Go Journal & Guide. **You will receive a confirmation email with an official receipt and link to download the digital resource immediately after payment is completed…all files are in PDF format. Please note these are digital resources and not mailed out as hard copies.